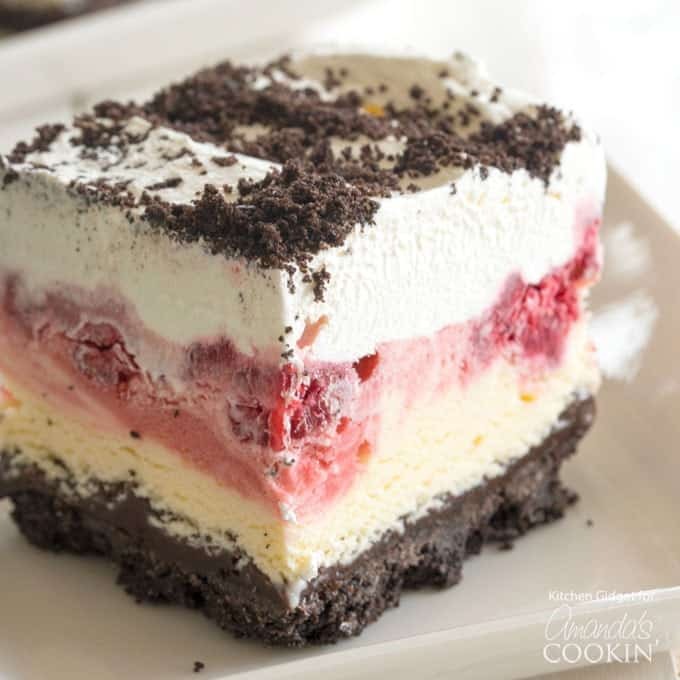 Strawberry Icebox Cake: a deliciously satisfying no-bake icebox cake! 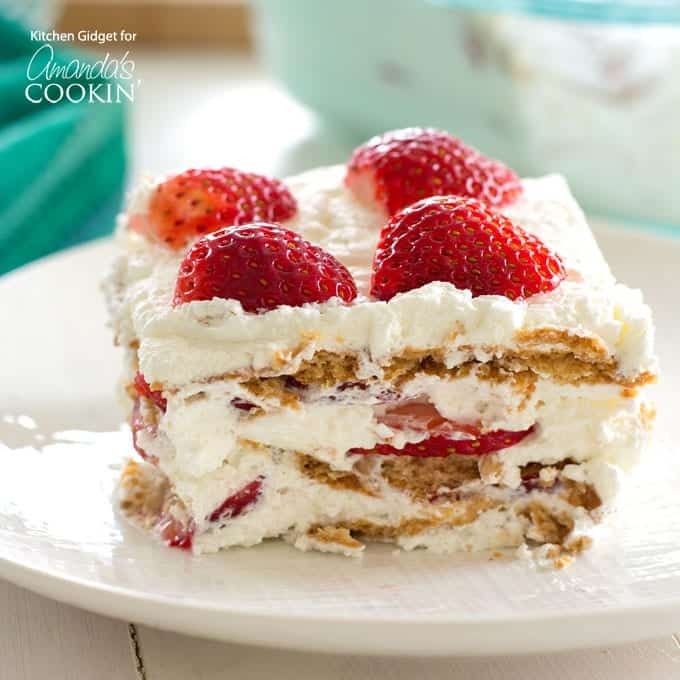 Take fresh strawberries and cream to the next level with this no-bake, one-pan Strawberry Icebox Cake. Fluffy whipped cream, juicy strawberries and graham crackers are all you need to make this potluck favorite! 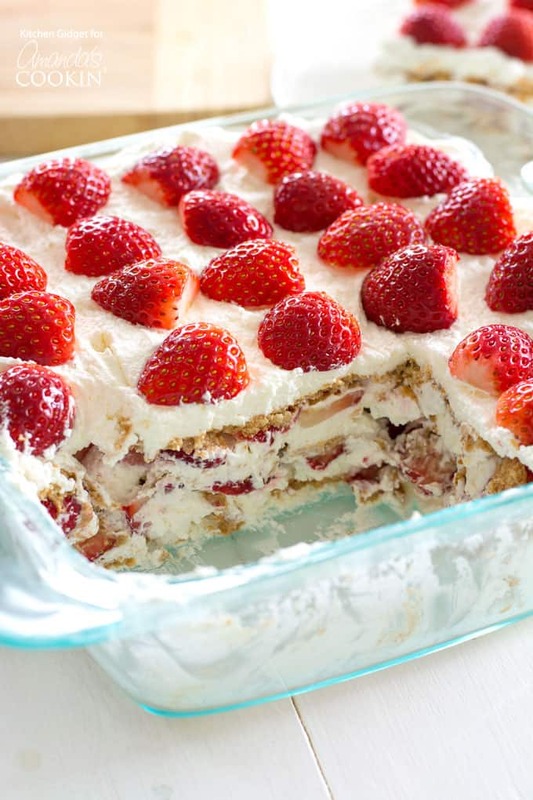 This strawberry icebox cake is the perfect summer version to the delicious S’mores Icebox Cake! I don’t even know where to begin with how amazingly delicious and easy this Strawberry Icebox Cake is! Like seriously, where have you been all my life? Strawberries, whipped cream, and graham crackers – that’s all you need to make this no-bake wonder. The ingredients are layered together and allowed to set in the refrigerator. The graham crackers soak up some of the sweetened cream and become soft like cake. Mushy cookies may sound weird, but trust me it works! It’s sweet, light and fresh without being too sugary. This is going to be a Spring and Summer staple for sure. Take this to your next potluck or cookout where it’s sure to be a hit. I’m partial to food in glass dishes—it looks so pretty since you can see the food, especially when there are layers. And not just desserts! My layered Fiesta Bean Dip disappears in minutes every time. While my bowl and beaters to whip the cream are chilling in the freezer, I slice up the strawberries. It’s good to have extra on hand in case you can’t help eating them like me. Whip the cream until light and fluffy. This takes less than five minutes with an electric mixer. You’re now ready to assemble. 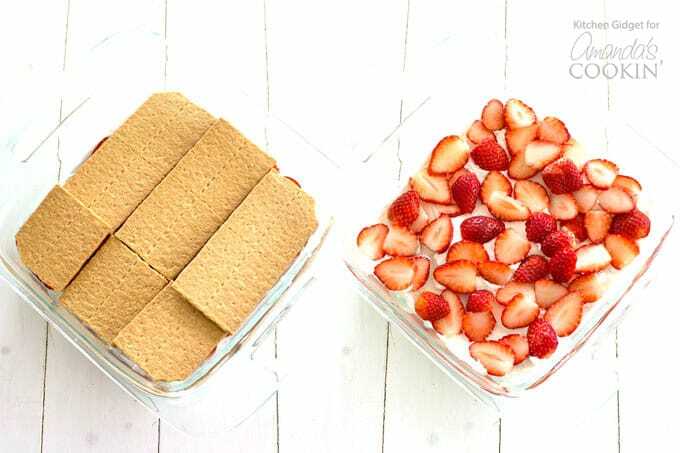 Place a smear of whipped cream on the bottom of your pan, this will keep your graham crackers from slip sliding around when you try to add the next layer. So, a smear of whipped cream and then a single layer of graham crackers. You’ll need to cut some of them to fit the gaps. Next, top with a layer of whipped cream and then a layer of sliced strawberries. From there, repeat the layers ending with a layer of strawberries arranged nice and pretty. Cover with plastic wrap and refrigerate for at least four hours or overnight. 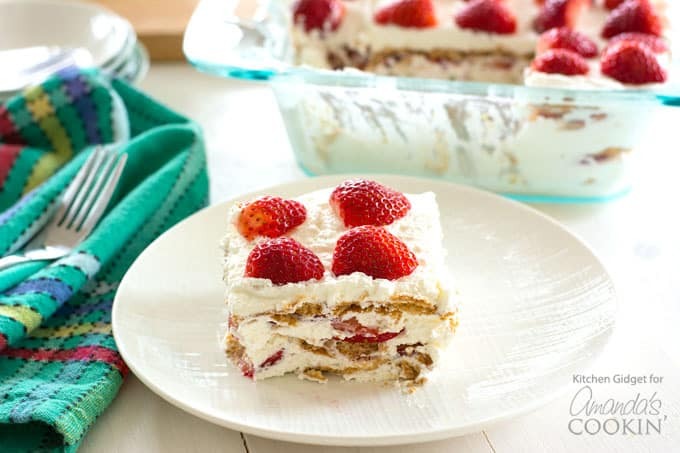 The crackers will be cake-like, the strawberries will have lent their fruity sweetness to the cream and your friends and family will thank you. 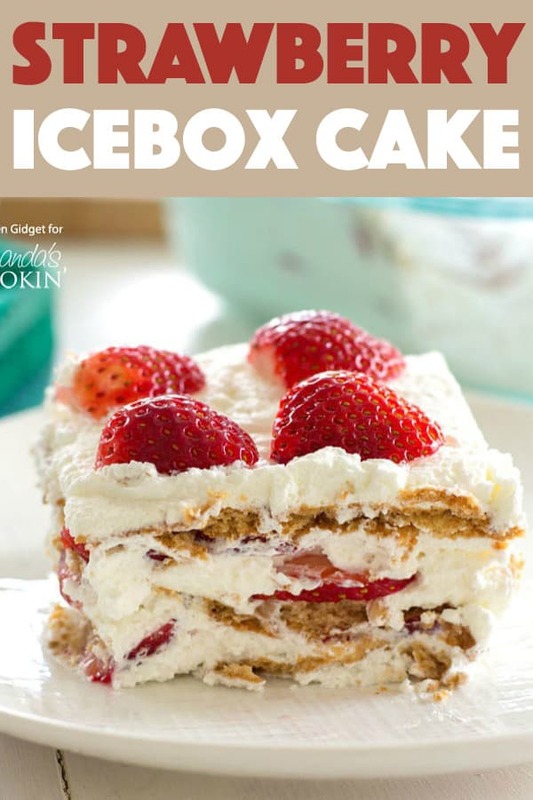 I mentioned before that this strawberry icebox cake is easy to make and it couldn’t be simpler. Since there are so few ingredients, I prefer to make a homemade whipped cream for the best flavor in this recipe, but you could also use cool whip. Enjoy! Since we are on the topic of desserts, I can’t go without mentioning our Raspberry Ice Cream Delight. This is the perfect dessert to make for a potluck, BBQ, or family gathering this summer! 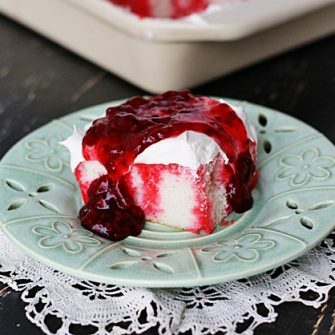 Check out even more delicious one-pan dessert favorites like the ever-famous Pineapple Dream Dessert, mouth-watering Chocolate Lasagna, classic Ambrosia Salad and Watergate Salad, and the perfectly fresh Lemon Lush! In a stand mixer or with a hand-held mixer, beat the cream, powdered sugar and vanilla until stiff peaks form. Place a very thin layer of cream on the bottom of a square pan. Next, add a single layer of graham crackers. Top with 1/3 of the whipped cream and smooth with a spatula. Add 1/3 of the strawberries in an even layer. Repeat layers 2 more times, ending with strawberries. Arrange the berries in a pretty pattern, if desired. Cover with plastic wrap and refrigerate for at least 4 hours or overnight before serving. Time provided does not include time needed to chill. WHY would you make a recipe for anything but a 9×13 pan???? Would you post or send me the recipe on how to make homemade whipped cream that you mentioned in this recipe. Thank you Amanda! To make whipped cream, pour one cup of cold heavy whipping cream into a chilled mixer bowl. Add a tablespoon of powdered sugar and 1/2 teaspoon of vanilla extract. Whisk on high until medium to stiff peaks form, about 1 minute. Yes, gramcrackers are sweet, but not as sweet as sugar cookies or chocolate candy. Animal crackers taste the same, so when I Ned to make a gramcracker crumb crust and I don’t have gramcrackers, I use animal crackers. I suppose dory this recepy, animal crackers would be too small. But just to give you an idea of what a gramcracker is. I’d love to make this one. I’m in Australia and we don’t have graham crackers. Can you tell me if they’re a sweet cracker and then l can find a substitute over here. Thanks. Hi, Helen. I believe wheatmeal biscuits may do the trick, but I’ve heard they are not as sweet. (Yes, graham crackers are a sweet cracker) Crunchy gingersnaps or Marie Biscuits are other alternatives as well. I hope this helps! Hope you enjoy it Mary! It’s a favorite around here :) Thanks for visiting! This looks so yummy, will have to try it soon. Have been making this for sometime. Delish! I also add strawberry jam on each cracker, takes a little longer to prepare but so worth it. Thank you Gloria! if you aren’t subscribed to the newsletter make sure you do that. it’s free and goes out weekly with lots of recipes and crafts!